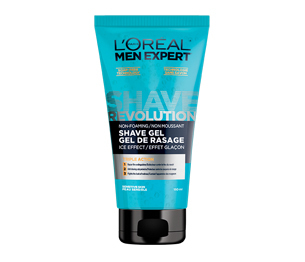 L’Oréal products for men is a line worth talking about. They are readily available. They can be found in all pharmacies and large surface stores. They are well priced and from our experience, are good quality products. In this review we will focus on their shaving gel. This was the first shaving gel I tried and it was somewhat of a different and pleasant experience. So it’s a gel and not a foam, making the feel on your face much cooler than what you might expect. It is not nearly as thick as foam which will require some adjustment in the proportion of product to use. You might need a few practice runs to get the right quantity for your shaving style. Keep in mind that the gel is clear, so you will not have the usual white reference on your face. It goes on smoothly and covers the face well enough. It offers plenty of lube to your blade and gives a comfortable shave. Lastly, it is easy to clean off with a warm wash cloth. I have bought a number of these tubes, so we can say that I liked it. It’s ease of procurement makes it an automatic staple. If you want an alternative to foam, this is a great “go-to” gel solution.